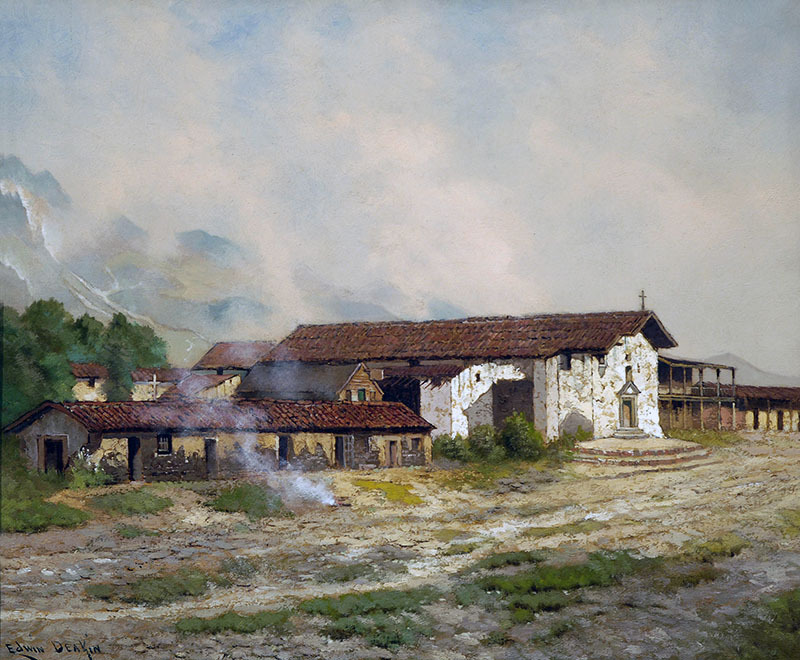 Mission San José. Courtesy of Santa Barbara Mission Archive-Library. Number fourteen in the mission chain, Mission San José originally named La Mision del Gloriosisimo Patriarch San Jose, was named in honor of Saint Joseph and founded on June 11, 1797 by Father Lasuén. The mission has survived a turbulent past. One of the largest missions, second in size only to San Luis Rey, Mission San José was practically destroyed by the earthquake of 1868. The monastery wing, which is now the mission museum, was one of the few buildings to have survived. The mission church, built in 1985, is an authentic replica. However, before this church could be constructed, the old wooden gothic style church, which stood on the mission property for more than one hundred years following the 1868 earthquake, had to be moved to the nearby city of Burlingame. In its heyday, Mission San José became successful in teaching the Indians music, thanks to the talents of Father Narcisco Durán. For twenty-seven years Father Duran worked at the mission, organizing both a choir and a thirty-piece orchestra that became famous throughout California. The relationship with the Indians was not, however, always harmonious. Estanislao, a local Indian, led a significant uprising in 1828 with several military expeditions required to put down the revolt. Here Indians were punished for theft, running away from the mission and failure to abide by the Christian way of marriage. The missionaries at San Jose tried to change the marriage practices of the residing Indians. Northern California Indians believed that a couple should live together prior to the joining ceremony to measure compatibility. Divorce and remarriage were acceptable. The missionaries however would have none of this. They wanted all Indian girls put into one home under the supervision of a Hispanic woman or Indian matron. Indian men would then have to ask for the future brides hand through the head missionary. Upon acceptance by all parties involved, a wedding ceremony would be planned. Until the current church could be built, the old, wooden, Gothic-style church stood there for over 100 years since the 1868 earthquake. Northbound: From I-880 south, exit and turn left onto Stevenson Road. Proceed to the end and turn right onto Mission Boulevad. Southbound: From I-680, exit at Mission Boulevard and turn right. The mission is on the corner of Washington and Mission. 10a - 4p daily, closed Thanksgiving, Christmas, New Year's, and Easter. Group tours for groups of twenty-five or more, reservations required. Please call 510-657-1797 x100 for further information. Please call 510-656-2364 for further information.